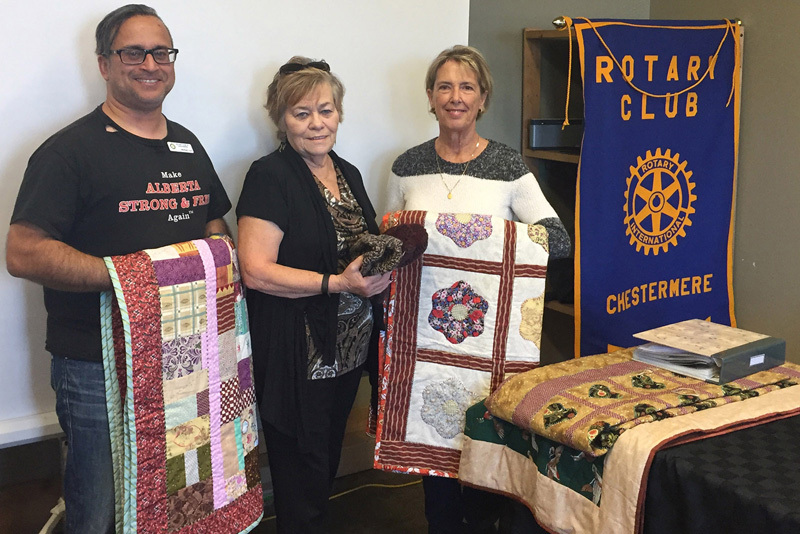 The Chestermere Whitecappers Quilters are combining a social event, creativity, and giving back to the community during their weekly meetings. The Chestermere Whitecappers Quilters have donated two quilts made by the group to Christmas with Dignity. “They take a while to make, you just can’t whip them up overnight,” said Chestermere Whitecappers Quilter of five years Carol Gardner. “It’s charity work. I like to see where my charity is going,” Gardner said. Every week is different for the Chestermere Whitecappers Quilters as each member is on a different stage of creating a quilt. In order for the Chestermere Whitecappers Quilters to be able to create a variety of quilts, they rely on material donations. “We wouldn’t be able to do it, but because we have it out there that we’ll take any material, we work with what we’ve got,” Gardner said. The group has been well-received by the community, Gardner added, people are constantly bringing bags of material that can be used. “What we find with the younger generations, they’re a throwaway society, when we were raised everything was used,” said Chestermere Whitecappers Quilter of six years Lorraine Webbster. Although giving back to their community is important, the Whitecappers Quilters also enjoy being able to give advice to each other. “We give advice, we’re sounding boards, it’s a learning experience,” Gardner said. Each member of the Chestermere Whitecappers Quilters enjoys expressing their creativity in a way that people can enjoy in their everyday life. Member of the Chestermere Whitecappers Quilters for three years Sheron Schacher said the best part of being involved in the group is having the ability to get other member’s input as to what would work the best. “Every time you make one, you learn what not to do next time,” Schacher said. “The beauty of it is we can try anything,” Gardner said. For more information on the Chestermere Whitecappers Quilters please visit the website at www.chestermerecrca.com/facilities/whitecappers-50-centre/, or to donate material please take it to 201B West Chestermere Drive.